Like Rolex, Panerai has an unmistakable look that is instantly identifiable. In fact, Panerai’s design codes are actually more stringent. A casual observer of the Panerai collection may remark that most of their watches look almost identical. 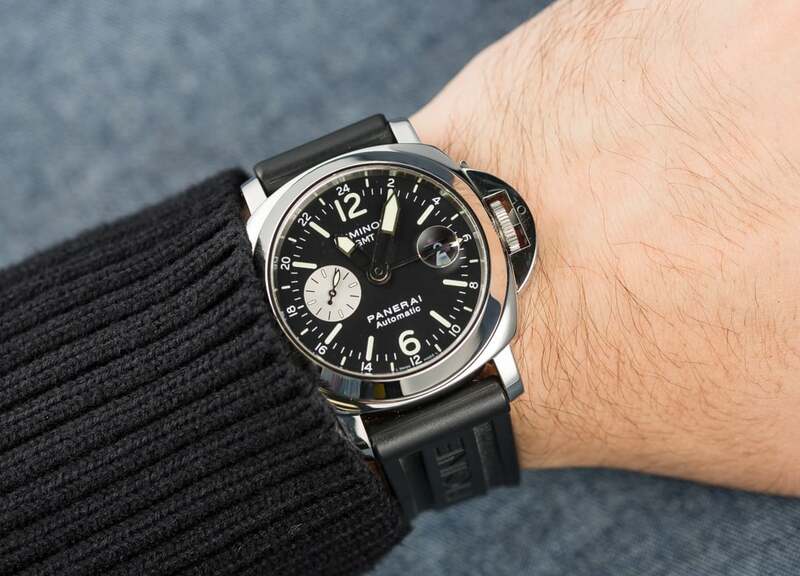 Yet, Paneristis – the term used for passionate Panerai enthusiasts – would adamantly disagree. It’s all about understanding the small, but important differences among the models that fuel their passion. Panerai enjoys a cult following among celebrities, top athletes, and politicians alike. Sylvester Stallone, Payton Manning, and Bill Clinton are just a few among the famous fans of the Panerai brand. Panerai Luminor GMT Automatic Acciaio 44m PAM00088 a GMT. 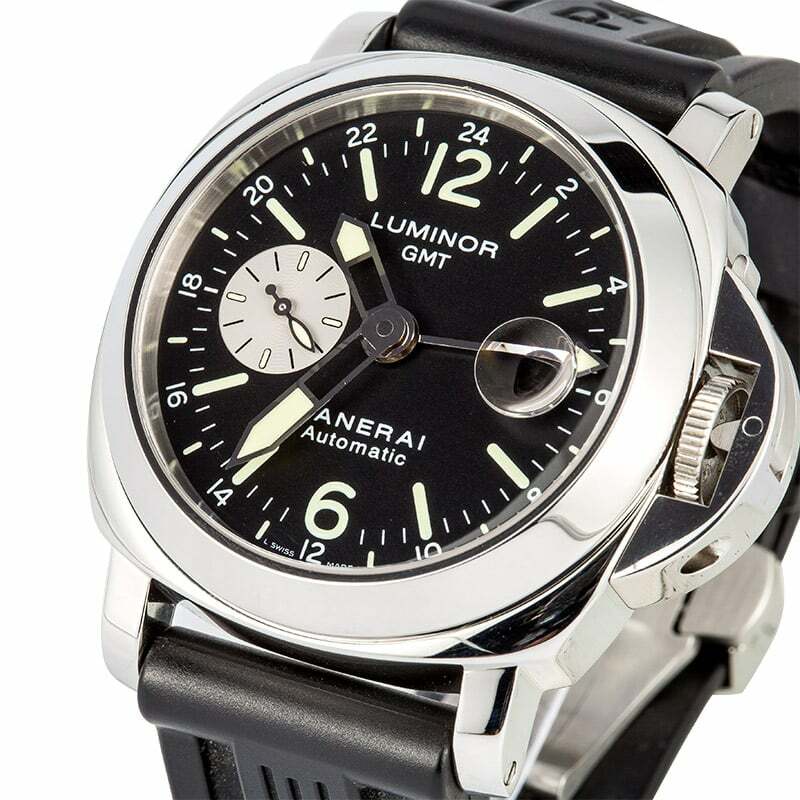 Essentially there are two main Panerai models – the Radiomir and the Luminor. And these two models also include vintage-inspired collections with the Radiomir 1940 and the Luminor 1950. The Radiomir watch was named after the “radiomir” radium-based material that Panerai patented in 1916 – a material that provided luminosity to the face of Panerai watches. Panerai presented the original Radiomir watch prototype in 1936 specifically for the frogmen of the Royal Italian Navy. In 1949, Panerai patented another luminous material that utilizes Tritium and dubs it “luminor”. The following year, in 1950, the Panerai unveils the Luminor watch. The chief differentiating design characteristic between the Radiomir and the Luminor is the bridge protecting the winding crown. An exaggerated crown guard so to speak. Opening the bridge allows turning and setting of the winding crown. while closing it renders the Luminor watertight and ready to plunge as deep as 300m underwater. This particular Luminor, PAM00088, is a GMT Automatic Acciaio. “Acciaio” is the Italian word for steel and as such, the 44mm case of the PAM00088 features a stainless steel case construction. Like the Rolex GMT collection, this Panerai allows wearers to keep track of two different time zones simultaneously. Where the seconds hand would normally sweep around the dial is instead a GMT-hand that points to the 24-hour scale to indicate a second time zone like a vintage GMT. The seconds are thus indicated via a small subsidiary dial positioned at 9 o’clock. Furthermore, on the opposite side of the dial, at the 3 o’clock position, sits a date window magnified by a lens attached to the sapphire crystal. The dial carries the distinct Panerai aesthetic with a clean black background, large Arabic numerals, and plenty of lume. Powering the PAM000888 Luminor GMT is the Panerai OP VIII caliber with 42 hours of power-reserve. The COSC-certified Panerai movement is safely housed behind the screw-down caseback. 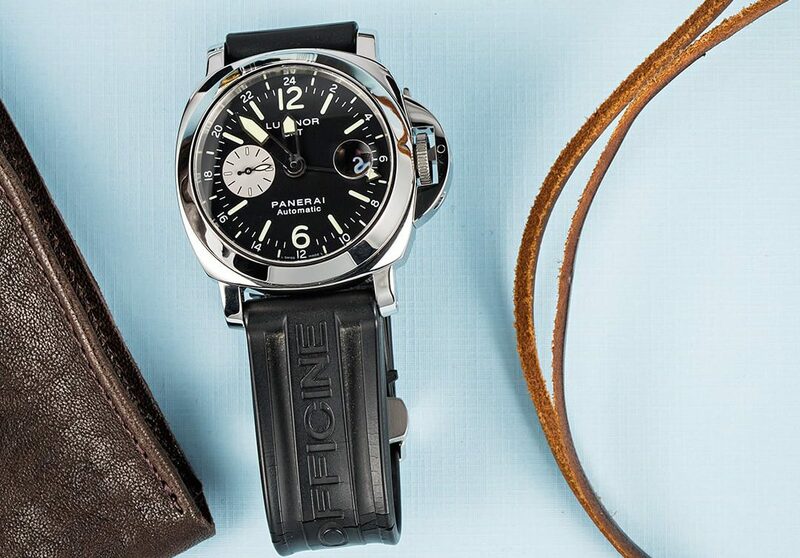 This specific Panerai PAM 000888 is outfitted with a sporty black rubber strap marked with “OFFICINE PANERAI”. However, the beauty of a Panerai watch is how easy it is to switch out the strap and the Luminor GMT also looks great dressed with a leather strap. A bold and modern luxury watch inspired by its military history, the Panerai Luminor is certainly a watch that doesn’t go unnoticed.